One time, I asked an expat friend on where to get really good Peking Duck here in Taipei and he recommended a place, but informed me that I need a membership to eat there or know someone that does to take me. My reaction to this was, “What the heck, the duck’s lineage better be royalty!” That’s just too rich for my blood and my pockets don’t run that deep. Luckily, my good friend Yaoching asked around for me and found a delicious place that doesn’t require a membership. TaoRanTing 陶然亭 Peking Duck Restaurant: (Map): This place is on the second floor and you might walk pass the door to get upstairs if you’re not paying attention. 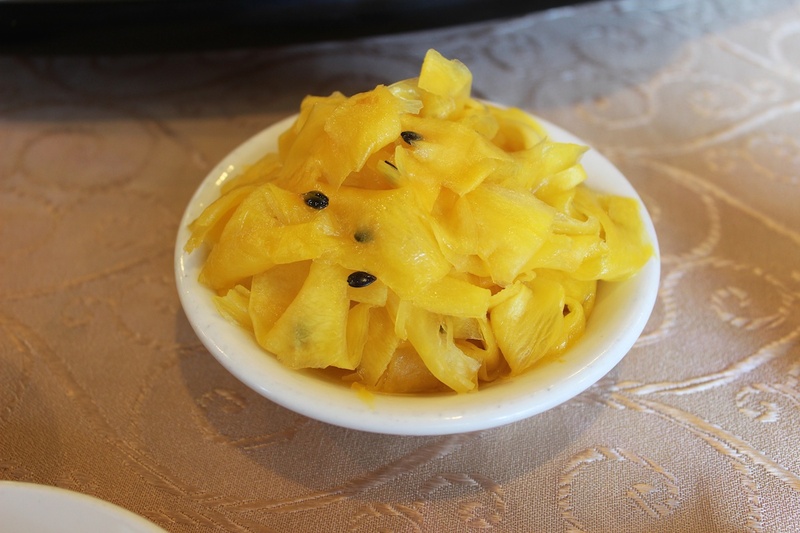 Each table automatically comes with several side dishes that are wrapped up. Note that they are not free, only unwrap the side dishes you want and you can tell the wait staff to remove the ones you don’t. 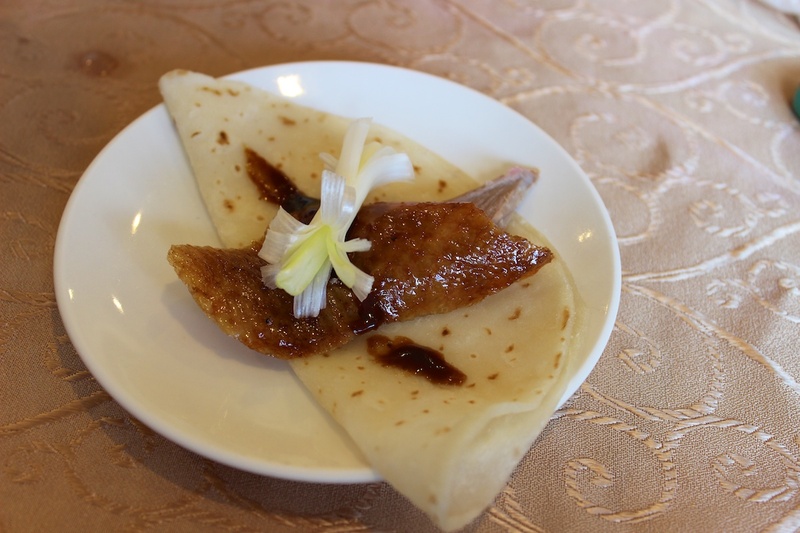 The Peking Duck meal comes with the pancake wraps, green onions, and sweet hoisin sauce. 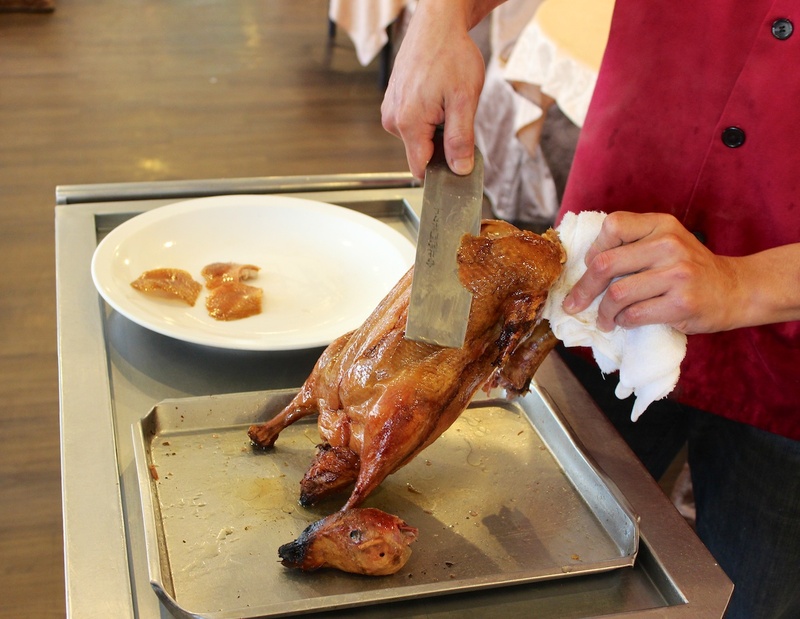 For an extra $100 or $200 NT, you can order additional dishes that are made from the meat or other parts of the duck. We have a total of 5 people eating here today for lunch and we are stuffed from the amount of food we ordered. 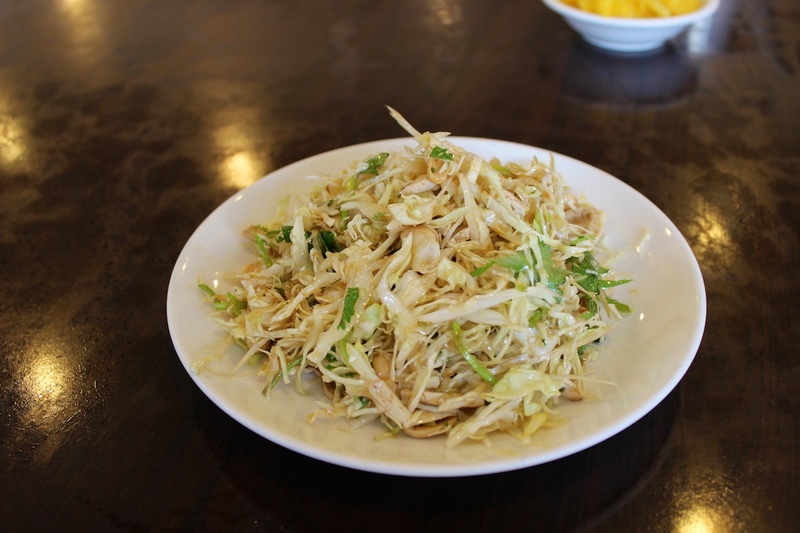 Side dishes that we unwrapped: The saltiness from the shredded cabbage in soy sauce and the sweetness and sourness from the pickled radishes are a good start to get your palate going before the duck. 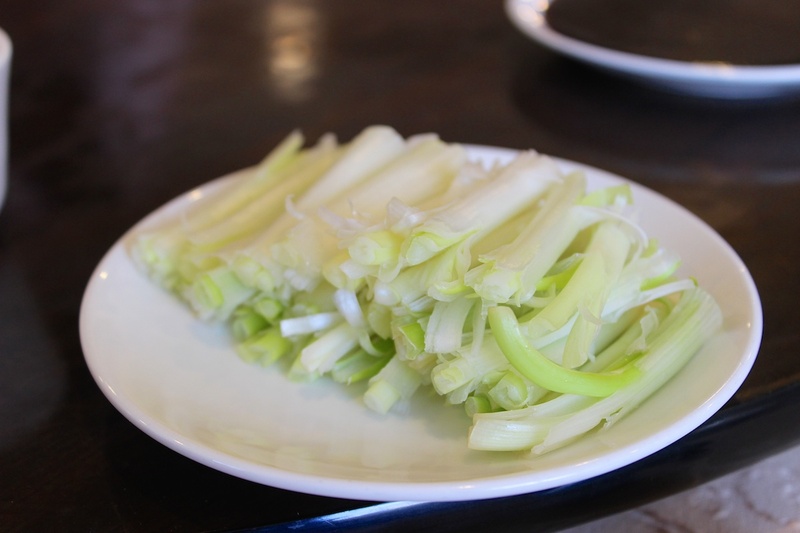 Sometimes, this dish comes out pre-sliced from the kitchen, but at this restaurant, it comes out piping hot and ready for the show. 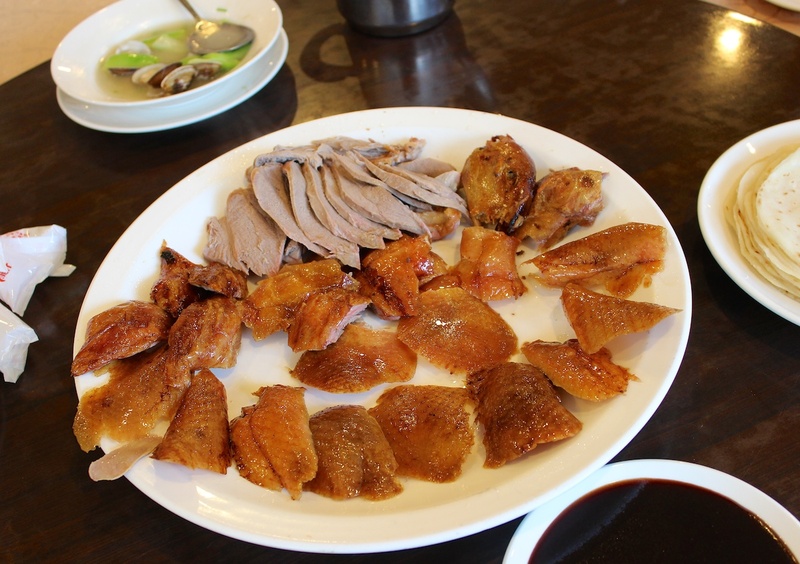 I like how this restaurant gives you the duck meat along with the crispy skin. Most places that I’ve tried in the States only gives you the skin and sometimes I need the textural contrast from the meat to balance out the fatty skin. 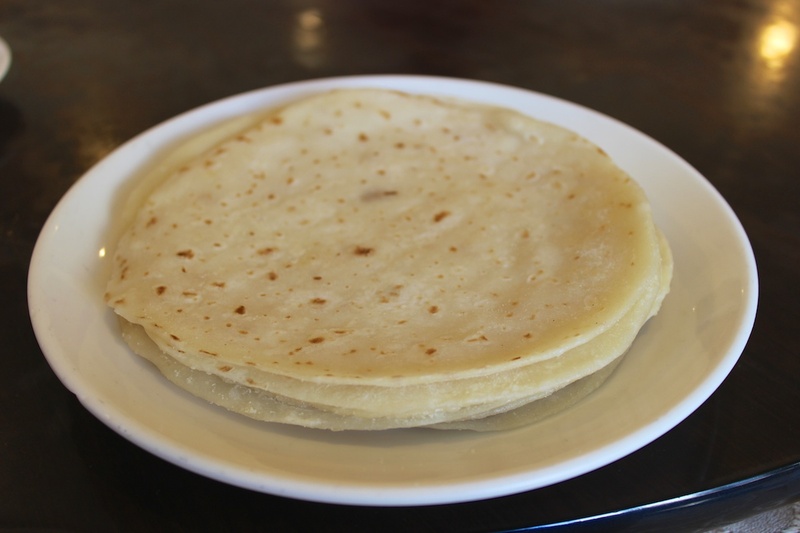 If you run out of pancake, you can order more for an additional cost. My piece of art: a little juicy meat, a little crispy skin, a sprig of onion, and a line of sweet hoisin. The additional dishes: We actually ordered 3 dishes: The duck wrap, the eggs cooked in duck fat, and the fried duck bones. All 5 of us didn’t even touch the fried duck bones because we were super full. Also, it didn’t look that appetizing for a photo. I suggest to just order the egg and wrap. 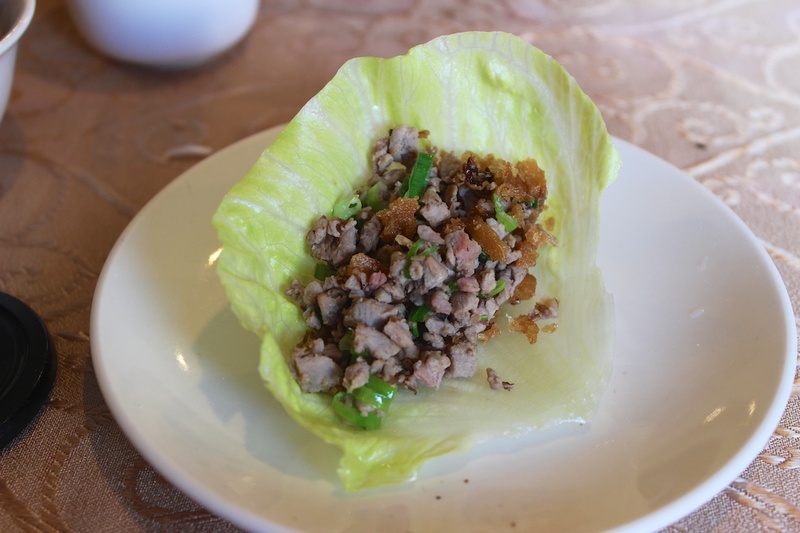 The duck wrap comes with fresh lettuce bibs and under the duck meat are these little fried cruller bits. I really like textural contrast of this dish. 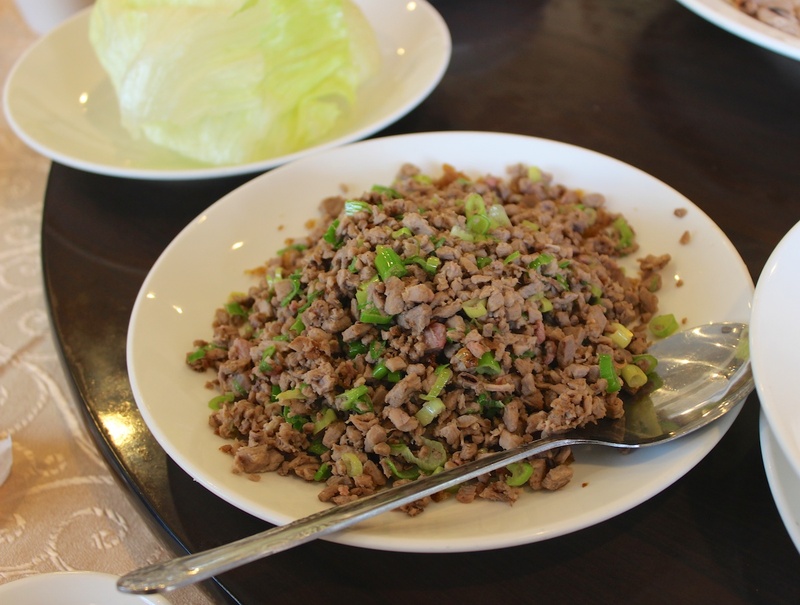 I get the freshness from the lettuce, the soft duck pieces with chopped green onion, and crunchy fried bits all in one bite. 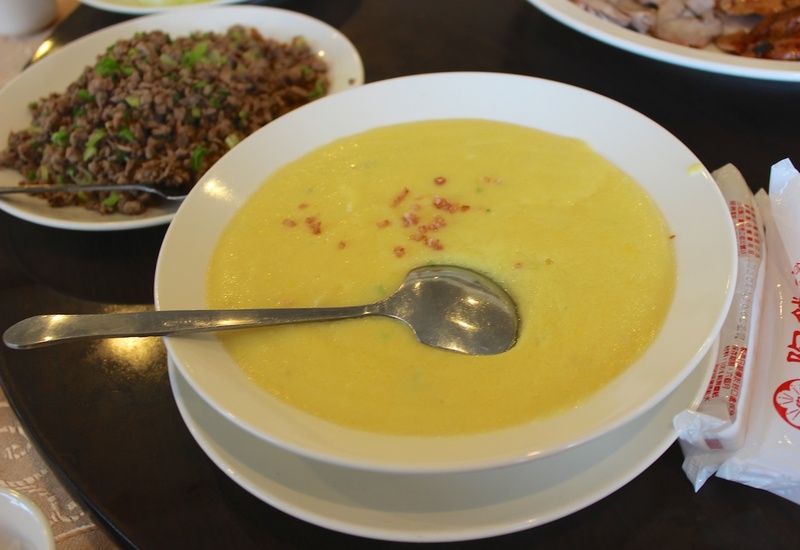 Initially when we ordered the eggs cook in duck fat, I thought we were getting eggs fried in duck fat, but, to my surprise, this dish is like an egg souffle — very light, fluffy and very rich. Again, our eyes are bigger than our stomachs because we ordered another dish. At least it’s a vegetable — I need the greens in my system. 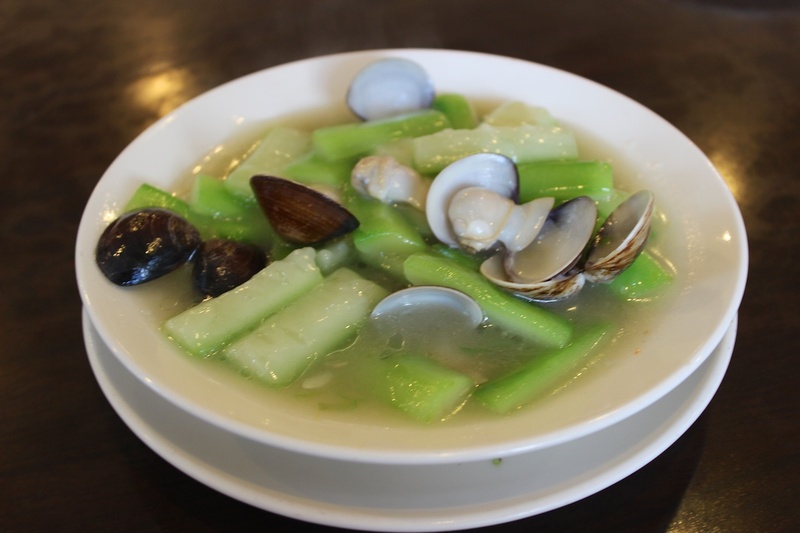 The dish is well seasoned with a little sweetness from the gourds and the fresh clams. Of course, we can’t end our meal without some desserts. 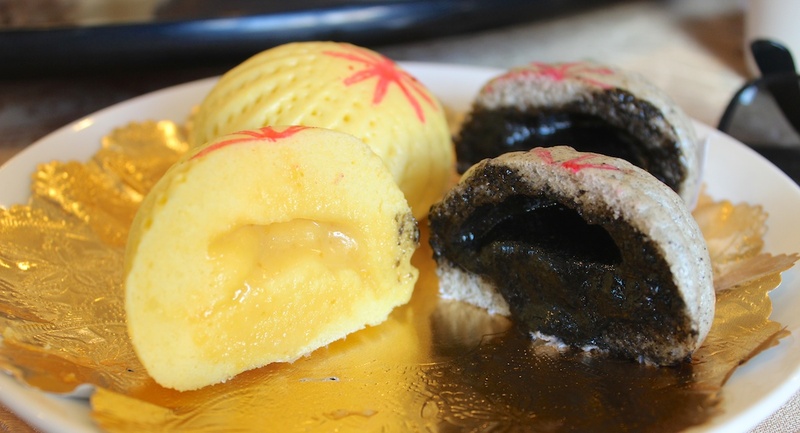 We got the black sesame and egg custard buns. 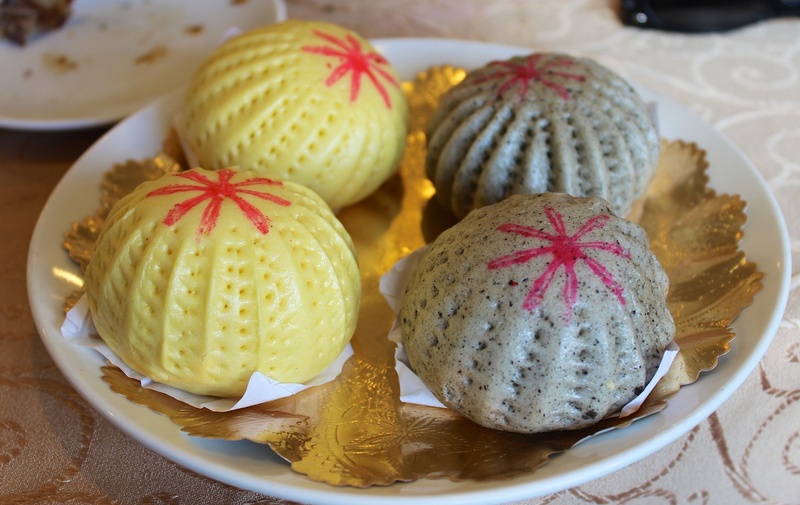 Both are superb, however, the black sesame is quite strong and concentrated in flavor, whereas, the egg custard is a little more mild.